The cost for camping is $4.00 per person, per night, with a maximum fee of $20.00 per person. You cannot reserve a campsite for more than 3 nights consecutively. Hazel Creek was once the site of a bustling mill town with several communities. Dating back to the early 1830's, Hazel Creek was settled by early pioneers and prior to that, Cherokee Indians. Growing with time, the area eventually became a bustling mining and log milling town. Remnants of the old town and life on Hazel Creek are scattered throughout. Old chimneys, stoves, and foundations can be observed all over. Covering a distance of almost 16 miles, the Hazel Creek Trail has a variety to offer. The biggest part of the lower section of the trail is an old roadbed with bridges crossing streams making for an easy outing; however, the northern section of the trail is much more difficult. The northern section changes from an old roadbed to a singletrack trail with numerous creek crossings, overgrown trails, and steep switchbacks. Be warned that navigating the northern section of the trail following a large rain storm can be very difficult and dangerous given the many stream crossing some of which are 2-3 feet deep. Along the trail there are several backcountry camp sites listed including 86, 85, 84, 83, and 82. These campsites don't offer much as they are backcountry camps. A stone fire ring and a bear line to hang your food are about the most that one can expect. These sites must be rented through the Great Smoky Mountains National Park Backcountry office. The area is teeming with various wildlife. While in the area I observed black bear, deer, grouse, and fox. There are gorgeous plants and open stream views throughout the trail. Take time to enjoy all that the trail has to offer. Fishing is allowed throughout Hazel Creek but beware that if it rains before or during your trip the streams can become large and fast making it difficult to fish. 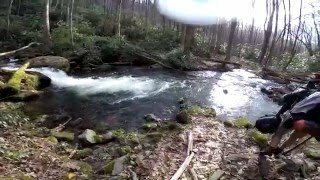 Numerous streams feed into Hazel Creek and there are several trails that connect to Hazel Creek Trail including: Welch Ridge Trail, Cold Spring Gap Trail, Bone Valley Trail, Jenkins Ridge Trail, and the Lakeshore Trail. Hazel Creek Trail only has 3 access points: hiking to the trail using the Lakeshore Trail and Welch Ridge Trail at either end of the trail, one of the many connecting trails or by boat from the Fontana Lake Marina (fontanavillage.com/shuttle-…) which will shuttle you to Ollie Cove Trail to access Hazel Creek Trail. The old Underwater bridge at the end of Hazel Creek Trail is completely torn out.